This article was first published in the Journal of Near Eastern Studies. Confusion has existed between the two similar words "Syria" and "Assyria" throughout history almost down to our own day.l Several years ago, an article appeared in this Journal of Near Eastern Studies (Vol. 40 : 139-40), by John A. Tvedtnes, called "The Origin of the Name 'Syria'," in which he rejected the long-accepted statement of Herodotus (7.63) that the Greeks called Assyrians by the name "Syrian" without initial a-. Tvedtnes proposed that the two terms are completely different and that Syria is derived from Hurri, an old Egyptian word for the Hurrians, which in Coptic would have changed to *Suri. In this article, I suggest that this explanation is most unlikely and that the statement by Herodotus is preferable. It is conceivable, of course, that the Egyptians had a term for the Hurrians which they confused with later Assyria/Syria, but both the vocalization of the word "Syria" and the reconstructed Middle Egyptian word *Suri present problems, while the identification of Assyria with Syria does not. To begin, the dropping of an initial a- is a widespread phenomenon in many languages. Especially noteworthy is the loss of an initial a- in Phoenician in some proper names in Anatolia in the first half of the first millennium B.C. and in Old Iranian.2 Consequently, the confusion of the two forms with and without initial a- presents no problem. Herodotus, as we have mentioned, having equated Syrian and Assyrian, makes a statement which appears strange (7.72). In describing the various peoples in the army of Xerxes and their costumes, he includes the Syrians together with the Paphlagonians and other peoples of Anatolia. He then adds that these Syrians are called Cappadocians by the Persians, which needs an explanation. Some years ago many cuneiform records of Assyrian trading colonies in Cappadocia dating from the first part of the second millenium B.C. were found in the excavations at a site called Kultepe.3 We may assume that the descendants of these settlers and merchants were in sufficient number to cause the Greeks to identify them as Syrians, whereas the Persians were more interested in the various lands they had conquered than in distinguishing their inhabitants ethnically or linguistically. The Achaemenids divided their empire into satrapies, and they called the people who lived in Cappadocia after the name of that land. Why did the Greeks call the people who lived there Syrians? I believe it was because they spoke the same language as the inhabitants of Syria and Mesopotamia. Recent research has shown that the Greeks first used the term Syria/Assyria at the beginning of the 7th century B.C., and their first contacts with the interior of the Near East were with the people of Cilicia and Cappadocia, whom they called Syrians.4 At that time, the whole area was under Assyrian control and the lingua franca of the entire area was Aramaic. The spoken language of the Assyrian court and bureaucracy was also Aramaic.5 Consequently, the Greeks equated the political empire with the Aramaic speaking population living in it, which was quite logical to the Greeks. The reasons for the spread of the Aramaic language were not only the expansion of the Aramaeans themselves into the Fertile Crescent, as early as the second millennium B.C., but also the policies of transfer of populations by the Assyrian state, especially in the 8th century B.C. under Sargon II and Tiglath-Pileser III. Large numbers of people were moved, and inhabitants of ancient Assyria (present-day northern Iraq) were also settled all over the Fertile Crescent.6 The spread of the use of Aramaic coincided with the political expansion of the Assyrian Empire, with the consequent mixture of the political term "Assyrian" and the linguistic term "Aramaic speaker".7 The use of the term "Assyrian" for the Aramaic language and alphabet is even found as late as the 6th century of our era when the rabbis of the Talmudic period speak of their Aramaic (modern Hebrew) alphabet as "Ashuri." 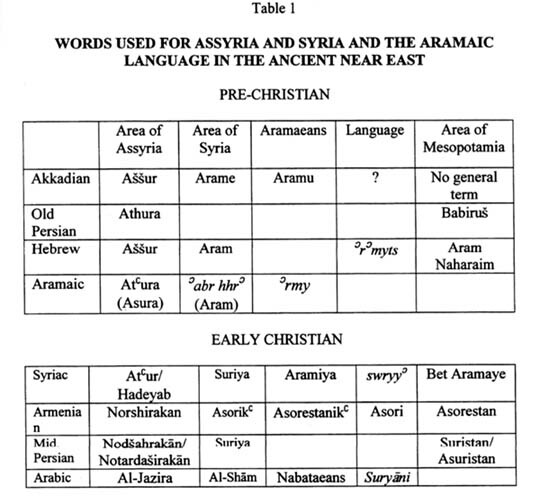 The Hebrews used the word Aram for the present country of Syria,8 but the Greeks only used for that land the designation Syria, although, according to Strabo and other authors, they knew that Aramaeans, or people speaking Aramaic dialects, lived all over the 'Fertile Crescent,' as well as in Cappadocia and elsewhere. At some point, however, the Greeks began to distinguish between Syria=the Levant and Assyria=Mesopotamia, and Herodotus may represent a turning point in this separation. After him, the separate designations continued in use until the time of the Romans and to the present in the West. The Romans made a Roman province of Syria with its capital at Antioch under Pompey in 62 B.C. By Byzantine times, the use of the word "Syrian" had expanded such that in writings of western Europe before the Arab conX,uests the subjects of the entire Byzantine Empire were, at times, called Syrians. To the east of the Euphrates, however, different designations prevailed, and there is some confusion in the use of terms. The Aramaic language spoken and written all over the Fertile Crescent came to be called Syriac in the West or Assyrian in the East, but inasmuch as the dialect of Edessa west of the Euphrates formed the basis of the Christian Classical Syriac language, only the term "Syriac" came to be used in the West, rather than "Assyriac." The latter, or rather different forms with prefixed a-, however, was used by the people of the East, especially by the Armenians who had an extensive written literature. For exarnple, we find in the history of Agathangelos (56 century) the expression "the Asori language," which is Classical Syriac.lø According to Diodorus Siculus (Roman History 9.23), after Alexander the Great, a satrap of Armenia called Orontes sent a letter to the Macedonian general Eumenes which was written in Syrian characters (Syriois). This was Aramaic, of course, later called Syrian by the Romans and Assyrian by the Armenians. The use of both terms, with and without a-. is found in writings of authors living to the west of the Euphrates. In the 2nd century A.D., the satirist Lucian of Samosata reputedly wrote a book in Greek De Syria Dea [The Syrian goddess], which has survived. It contains interesting passages relevant to the usage of the terms "Syrian" and "Assyrian." The author says (par. 1): "I who write (this) am Assyrian." Later (par.11), he says, "he calls the people of Syria by the term Assyrian," and (par. 15), "he came to Syria, but the people beyond the Euphrates did not receive him" (cf. also pars. 23 and 59). Macrobius, a writer of the 5th century and a pagan, wrote a book called Saturnalia which recalled antiquity and themes of Virgil in reaction against the Christian spirit of his day. In this book (1.23.14-16), he speaks of the cult in which the Assyrii (i.e., Syrians) dedicated offerings to the sun in the village of Heliopolis (modern Baalbek). This off-hand usage of Assyrian for Syrian by Macrobius indicates that the two forms, with and without a-, were in use, even for inhabitants of the baqaC Valley in modern Lebanon. The Armenian author Moses of Chorene (perhaps 8th century) in his history of the Armenians uses "Asori" and "Chaldaean" as synonyms, and he uses "Asori" for the Syriac language.1l It is fascinating to observe that the classical Armenian word for the present country of Syria is AsorikC, and the ancient Parthian word for the Roman province of Syria is "sswrys".l2 Perhaps the Armenian form is derived from the Parthian. It seems clear that the general terms "Assyrian" and "Syrian" were regarded as synonyms not only in early times but late into the medieval period by at least some people in the East. The Arab conquests brought a new term into the Near East, for the Arabs called the land of present-day Syria al-Sham. In western writings, however, the terms "Syria" and "Syriac language" continued in use. What did the Neo-Syrian Aramaic-speaking Christians in the Near East call themselves in the Middle Ages? Michael the Jacobite patriarch of Antioch (1166-99) wrote that inhabitants of the land to the west of the Euphrates River were properly called Syrians, and by analogy, all those who speak the same language, which he calls Aramaic (Srmy~), both east and west of the Euphrates to the bordeers of Persia, are called Syrians.l3 He continues that the basis of the Syriac language, i.e., Aramaic, is from Edessa (Urfa). Even more interesting is his remark (vol. 1, p. 32) giving the names of peoples who possessed writing, among them are SiwryS d hywn swryyS, "Assyrians," i.e., "Syrians," by which presumably he means the ancient Assyrians, whom he identifies with his contemporary speakers of Syriac. This book by a learned native speaker shows the continuous equating of the terms "Syrian" and "Assyrian" for many Eastern Christians. The connection of the word "Assyrian" with the empires of ancient Assyria, on the other hand, probably was emphasized by Western missionaries and was then eagerly accepted by many eastern Neo-Syriac speaking Christians. The discoveries of ancient Assyrian sites and cuneiform records about the rulers of ancient Assyria stimulated interest among local Christians who had only heard about Assyrian kings from the Bible. This modern history of the usage of "Assyrian," however is not our concern here. The early historical record of the usage of "Assyrian/Syrian" shows two facts clearly, first, confusion in Western usage between Syria for the western part of the Fertile Crescent, and Assyria for the ancient land east of the Euphrates, and, second, the Eastern usage, which did not differentiate between the two except under Western influence or for other external reasons. The Easterners retained historical usage of their own until the modern period. Archaeological discoveries of the end of the l9th century together with the adoption of Western terms, particularly from the period of post-World War I colonial mandates, when terminology was fixed according to Western usage, changed the old Eastern usage. At the present, the term "Neo-Syriac" or "Neo-Aramaic" is used by linguists for the language in its spoken form in dialects such as those in Tur Abdm, Urmia, MalCula, or wherever the language may be spoken. Some of those speakers of Neo-Syriac who live or lived in present-day Iraq or Iran prefer to call themselves Assyrians to distinguish themselves from the inhabitants of present-day Syria. They are not wrong in this designation, or in claiming descent from the ancient Assyrians, who had adopted the Aramaic, or the Syriac language, as it was later called in Christian times, as their everyday tongue. Just as modern Egyptians, although they speak Arabic, claim to be descended from the ancient Egyptians, or some inhabitants of Anatolia, although they speak Turkish, claim descent from the Hittites or other ancient peoples of Asia Minor, so the modern Assyrians, with more justification, since their language is a Semitic tongue related to ancient Assyrian, claim descent from ancient Assyrians; and history is more the record of what people believe than the mere recording of events. Note: later names for the land of present-day Syria, borrowed from Greek or Latin, such as later Hebrew swryh are not cited here. 1 The origin of the name Assur/A��ur, and the complicated relations between deity and town, not to mention the expansion of the term to include a land area cannot be discussed here. 2 See P. Kretschmer, "Nochmals die Hypachaer und Alaksandus," Glotta 24 (1932): 218-19, a section entitled "Der Abfall des anlautenden A: Kleinasiatischer Eigennamen." Many Iranian languages exhibit the same phenomenon. See E. Herzfeld, The Persian Empire (Wiesbaden. 1968), pp.306-7. 3 See Seton Lloyd. Early Anatolia (London. 1956), pp. l 12-26. 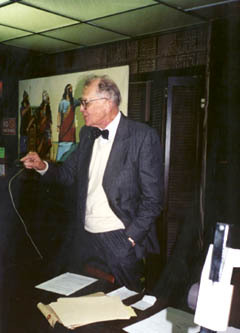 4 See the extensive study by P. R. Helms, "Greeks in the Neo-Assyrian Levant and 'Assyria' in Early Greek Writers" (Ph.D. 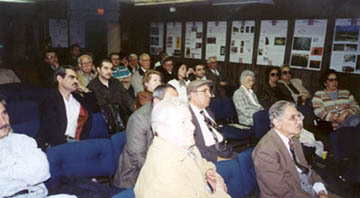 diss., University of Pemnsylvania, 1980), esp. pp. 236-39, 280-94, and 304. The Greeks got the name "Assyria/Syria," with -ss- for s-, from the Cappadocians, while the Aramaeans called Assyria by the dialect name AtCura, whence Old Persian Athura. The term "Chaldaean" comes from a tribe of Aramaeans who settled mostly in southern Mesopotamia. 5 Beginning with the reign of Assurnasirpal in the 96 century B.C., and an ever accelerating pace until Esarhaddon and Assurbanipal in the 76 century, more and more people in cities such as Nineveh and Arbela spoke Aramaic. Even lower classes, except for peasants in out-of-the-way villages, all over the area of modern northern Iraq, knew little or no Assyrian but spoke Aramaic. Probably bilingualism was more common as one went up the social ladder, with dialects of the court, the army, etc. It should be noted that Esarhaddon's mother was an Aramaean (as Hayim Tadmor pointed out to me). Even though the Greeks used the form Syrian, they also knew the form Assyrian, and this must have been confusing, as it was to the Romans as a glance at the Thesaurus linguae latinae 1.940 shows. 6 See Oded Bustenay, Mass Deportations and Deportees in the Neo-Assyrian Empire (Wiesbaden, 1979),pp.116-35. 7 As late as Pliny (6.30.117) we find: "The whole of Mesopotamia once belonged to the Assyrians." It is difficult to determine how the inhabitants of the Assyrian Empire were designated and differentiated, whether as nise mat Assur, "the people of Assyria," or mare mat Assur, "natives of Assur," or simply the term asibu, "inhabitant." 8 In the Bible, the Ararnaeans and their land Aram are usually associated with the Syria of today, but in the title of Psalm 60, the expression "Aram Naharaim" is found, meaning Mesopotamia. For the Greeks, it is insufficient to refer to a letter of Themistocles where Ararnaic is referred to as Assyria grammata; cf. C. Nylander, "Assyria rrammata: Remarks on the 215t Letter of Themistocles," OpusculaStheniensia 8 (1968): 122-36. 9 See J. Bury, ed., The Cambridge Medieval History, vol.2 (Cambridge, 1936), p.l56. 10 Agathangelos, History of the Armenians ed. 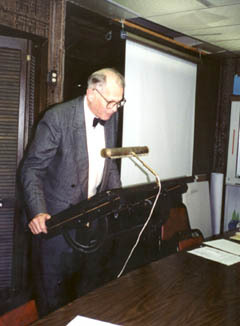 Robert M. Thompson (Albany, 1976), p. 375. 11 Moses KhorenatsCi, History of the Armenians, trans. 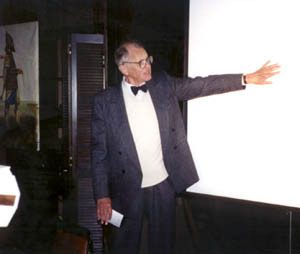 Robert W. Thompson (Cambridge, Mass., 1978), pp.67 and 94. 12 For Armenian, see any dictionary of Annenian and for ParFian, P. Gignoux, Glossaire des inscriptions peh-levies et parthes (London, 1972), p. 47. 13 J. B. Chabot, ed. and tras., Chronique de Michel le syrien, vol.3 (Paris, 1905), text 524, trans.78. 14 H. Chick, ed. and trans., A Chronicle of the Carmelites in Persia, 2 vols. (London, 1939), p. 100, Jacobite Syrian; p. 107. George an Assyrian (Nestorian); p. 198. Assyrians or Jacobites; p. 132, Eastern Assyrians; and throughout Chaldaean. 15 See John Joseph, the Nestorians and Their Muslim Neighbors (Prinston, 1961), p. ix, where he says the name Assyrian did not appear before the 19th century, and p. 14, where he attributes the emergence of this name to archaeological finds and Western missionaries who brought the name to the local people. As we have seen in this article, some people used the term Syrian and others Assyrian before the 19th century.